Commissioned by the RightHere Showcase. Additional funding provided by private funders. "The Master/a piece that manifests itself from thin air" is a sister piece to epic dance and theater work “The Student." Finding itself inside the depths of “The Student,” “The Master” embodies a reality theater experience. The work takes the stance that we are on this earth to master ourselves, and we can only partake in our lives as much as we are aware of it. The action generates a plot of desire and plain passiveness in our lives and how we manage to pull ourselves out of the abyss and clean up the mess that is of our own making. Culminating into a theater fantasy, “The Master” is about manifested drama on a personal and theatrical level. "In her dance-theater work "The Master," Vanessa Voskuil evoked zen serenity and cosmic uncertainty with a surge of movement that can only be described as speaking in gestural tongues. Like the set that she and her fellow performers demolished in the finale, Voskuil dismantled herself and illuminated all the working parts. She gave an intensely focused performance, simultaneously invoking ingénue and crone, trickster and guru. 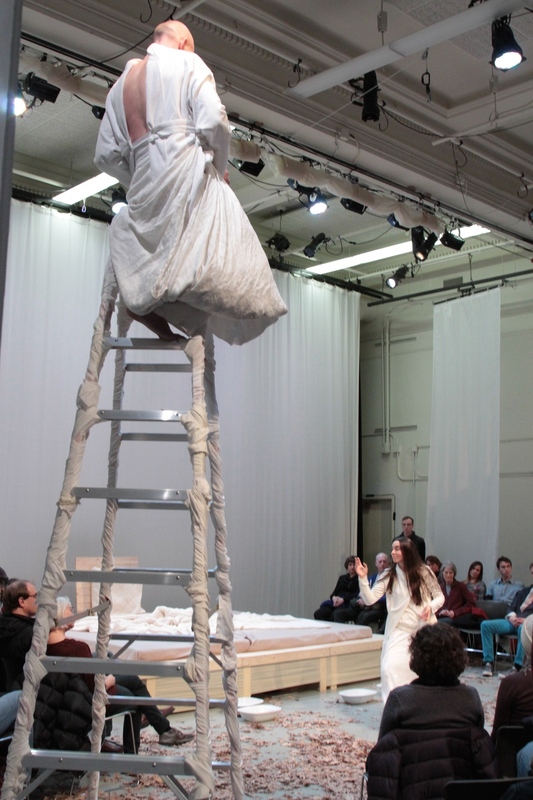 Moving to a highly philosophical and at times mordantly funny taped text about (among many other things) the relationship between performer and audience, Voskuil summoned up the mad woman in the attic by way of Mozart's "Queen of the Night." - City Pages, "Best Dancer Minneapolis 2015"
“The Master” realizes it is trying to be a master and works to finds itself in a manner of learning instead. It is a real work of real nature in real time and real part of real time and nature. It culminates into a fantasy and says “why is it here at this time being created for itself or for its master?” It is a matter of knowing itself and of itself and it tries to believe itself around itself. It is of itself and only cares for itself. It tries and tries and it fails to see what it is. A matter of knowing who it is to be a master in time and space and energy and light and peace and love and generosity. “I know that you know that we are here to know what it is that I am doing at this time and I know only that you know that we are knowing nothing but something at this moment.” The piece wants to define itself and wants to understand itself and says it is of itself only at this moment. What is real is defined and what is manifested is defined only in the context of the work. It is here that we begin to see a sort-of real-time-space continuum and feel that we can disturb the work with our presence. It is here that the audience can see and sort out his/her manner in relationship to the work that adjusts to its surroundings. The audience keeps a bowl and water for the performer and asks to pour the water into the space into a bowl. It is here that we see one thing and one thing only, a person lifting their feet to feel the water flow under her feet. We see her walk inside the bowl. We see her moving to one bowl to another wondering why she is doing this. We see one thing and another thing and once it is done, we wonder what does it all mean? We wake up at that moment from our fourth-dimensional, observatory space and find that we are invited to sit on the bed that was manifested for the work. We speak to each other, perhaps, and we adjust ourselves for better viewing. This is all a part of the work. Adjusting to see. This is the work itself. It is adjusting to see what it is that we cannot see. We see and then we cannot see. We move to know. This is the heart of the work. We know sometimes and other times we don’t. We journey to the center of this work to know one thing and that is the work of working to know one’s self, which is only a step away from yourself. It is past this moment that we sit and adjust and know how to be that we begin to speak to one another as we are directed to during the work. We begin to see outside of ourselves the one thing that is missing, which is time to know. It takes time to know someone and we only begin to know that one person that is next to us. We begin to know one person next to us and not the other persons that are next to us. We begin to journey into a sort-of space that is continuous and monstrous and volatile. For we are continuing on in a manner that is questionable for we have not known what we were doing before that took so much time to do. We are doing what it is that we are doing at the moment and then we wonder what is it that we really want to be doing and we wonder why it is that we are here and we wonder why is it that we have come and we wonder why is it that we want to know what the next moment of the work is. It is here that we begin to understand that we are not understanding the work and begin to know nothing but nothing and something has begun to grow out of the piece that was before. It is continuing in a different form and then it stops. The work continues and stops for moments at a time, knowing it is continuing either way towards a betterment of itself. It is journeying around and around and around until it stops, for it is nothing but something now in a moment’s notice and then gone. The end. It is now that we can continue and move and grow and continue and move and grow and continue onward until eternity.